She professed faith in Christ and was a member of Elk Horn Baptist Church. 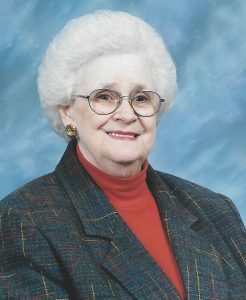 Geneva was a retired employee of Fruit of the Loom in Campbellsville. She is survived by two sons and three daughters: Peggy Humphress and husband, Wally of Campbellsville, Kathy Bagby and husband, Larry of Mannsville, John Sidebottom and wife, Judy of Burlington, Jim Sidebottom and wife, Judy of Bardstown and Monta Rae Eastham and husband, Jeff of Sturgis; fourteen grandchildren: Tammie Creason, Randy Cox, Genesia Sallee (Timmy), Laura Sue Mason (Bill), Anthony Humphress (Katie), Amanda Rice, Derick Sidebottom, TJ Kabler, Kasey Sanders (Tara), Kelly Sanders, Nathanael Bell (Kirsten), Nicholas Eastham (Brittany), Dustin Eastham (Cori); two step-grandchildren: Shawn Bagby (Lindsey) and Jeramie Bagby (Brandy): twenty-four great-grandchildren; six great-great-grandchildren; several nieces and nephews and many other relatives and friends. She was also preceded in death by a daughter, Martha Sue Sallee June 11, 2005; a grandson, Chris Sallee June 10, 2017; one brother and two sisters: Joe Thomas Morris Febuary 9, 2003, Cleo Shofner Febuary 2, 2010, Marie Chewning Febuary 7, 2008.